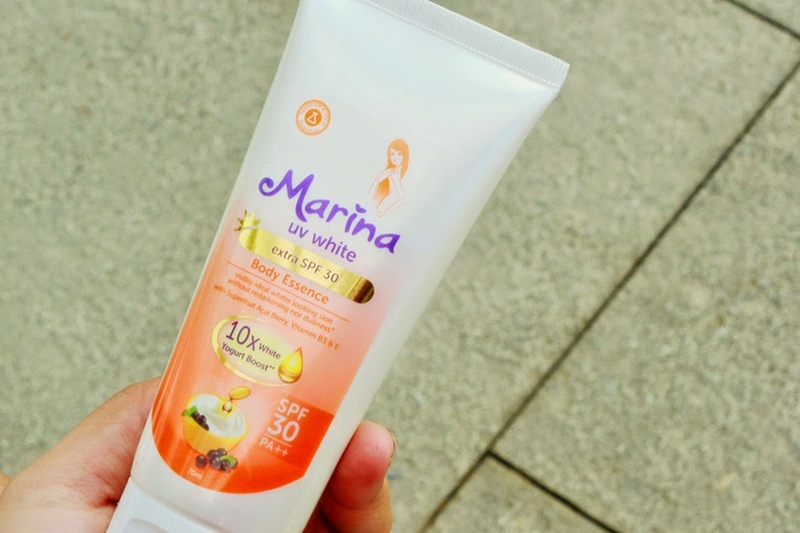 And if you are a regular reader of this blog, I love all Marina products and I’ve reviewed about Marina UV White Body Essence. Marina UV White Body Essence with multiple concentrations of active ingredients, will make our skins look whiter without re-darkening or dullness. Living in Manado which means I need to face the fact that the weather is easily changing spontaneous and as you being a public health student and a member of Manado rolling, I often spend my days outside doing my activities & hobbies so I need to protect my skin because it drained my skin and made me looked dull. Luckily, I have known this Marina Body Essence since last October 2014 and it became my best companion with its extra SPF 30 (it means it’ll protect your skin from dangerous UV A & B rays from the sun that might causing sunburn, unhealthy skin, darker skin, black spots, skin damage or worst skin cancer), Marina Body Essence also formulated with Superfruit Acai Beryy (high antioxidant), Vitamin B3 & E and 10x white Yogurt as skin nourishment boost. The fruit scent from this Body Essence totally my favorite part of this product. 4. Peserta wajib memasang widget Marina Body Essence Blog Competition pada sidebar blog atau di dalam postingan sebagai tanda keikutsertaan kontes blog, serta wajib memasang banner kompetisi Marina Body Essence Blog Competition. 5. Artikel atau postingan tidak boleh menyinggung SARA, berbau pornografi dan melanggar undang undang yang berlaku di indonesia. Pertama, tentukan dulu tema + bahan tulisan yang ingin kalian sampaikan, usahakan semenarik mungkin dengan tambahan foto-foto atau video yang mendukung tema tulisan kalian. Kedua, pilih produk yang sesuai dengan keinginan dan yang cocok untuk kamu, karena tiap wanita memiliki kekhasan dan selera masing-masing. If you want to give the Marina UV White Body Essence a try, they are available at your nearest mini market & supermarket and most places that sell makeup at an affordable price :D Additionally if you want more latest products of Marina, be sure to LIKE SAHABAT MARINA’s Facebook Page to get updates for more good beauty products and deals.